1. Identify your application’s development/interface requirements (managed, native, etc). 2. Adapt the NatNet sample code from the corresponding NatNet sample application in the samples folder into your application. 3. Use the API reference in the next page for additional information. The Visual Studio solution file \Samples\NatNetSamples.sln will open and build all of the NatNet sample projects. If you are creating an application from scratch, please refer to the following sections for application specific requirements. The following projects are located in the NatNet SDK\Samples folder. The following sample projects utilizes NatNet SDK library for obtaining tracking data from a connected server application. Matlab Managed: Matlab Sample MATLAB code file (.m) for using MATLAB with the NatNet managed assembly (NatNetML.dll) using the provided natnet.p wrapper class. RebroadcastMotiveData Native: C++ Sample application that receives tracking data from the NatNet Server and redistributing it in other forms. Currently there are two protocols supported for pipelining tracking data into Unity via compatible XML packets and into Previzion software via serial port interface. 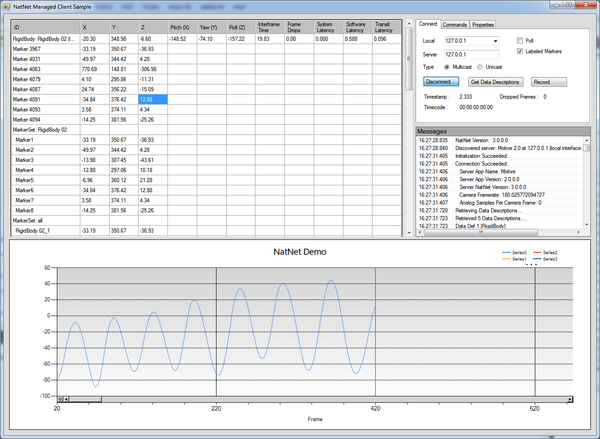 SampleClient3D Native: C++ Sample NatNet application that connects to a NatNet server, receives a data stream, and displays that data in an OpenGL 3D window. SampleClientML Managed: .NET (C#) Sample NatNet C# console appication that connects to a NatNet server on the local IP address, receives data stream, and outputs the received data. Note: Skeleton As Rigid Bodies must be set to false. TimingClient Native: C++ This program connects to a NatNet server and can be used as a quick check to determine packet timing information. WinFormsSample Managed: C# .NET Simple C# .NET sample showing how to use the NatNet managed assembly (NatNetML.dll). This sample also demonstrates how to send and receive the NatNet commands. The following sample projects do not use the NatNet SDK library. Client/Server connection is established at a low-level by creating sockets and threads within the program, and the streamed data are depacketized directly from the bit-stream syntax. The following sample approaches should be used only when the use of NatNet SDK library is not applicable (e.g. streaming into UNIX clients). PacketClient C++ Simple example showing how to connect to a NatNet multicast stream and decode NatNet packets directly without using the NatNet SDK. PythonClient Python Sample Python code file (.py) for using Python with NatNet streaming. This sample depacketizes data directly from the bit-stream without using the library. The following samples demonstrate how to use remote triggering in Motive using the XML formatted UDP broadcase packets. BroadcastSample C++ XML broadcast. Sample application illustrating how to use remote record trigger in Motive using XML formatted UDP broadcast packets. NatCap C++ XML broadcast. 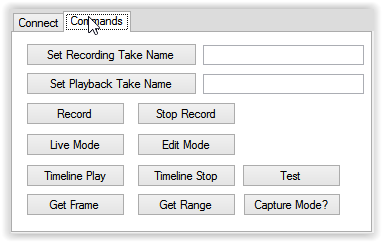 Sample capture start/stop trigger broadcast app. 1. [Motive] Start the Optitrack Server (e.g. Motive) and begin streaming data via the Streaming Panel. 2. [SampleClient] Start the client application from the command prompt or directly from the NatNet SDK/Samples/bin folder. 3. [SampleClient] Once the sample application starts up, it will search the local network and list out IP addresses of available tracking servers where tracking data is streamed from. Select a server address by pressing the corresponding number key. Motive is streaming to the local loopback address, and it is detected by the SampleClient application. 4. [SampleClient] The client application is connected to the local loopback address (127.0.0.1) and receiving tracking data. 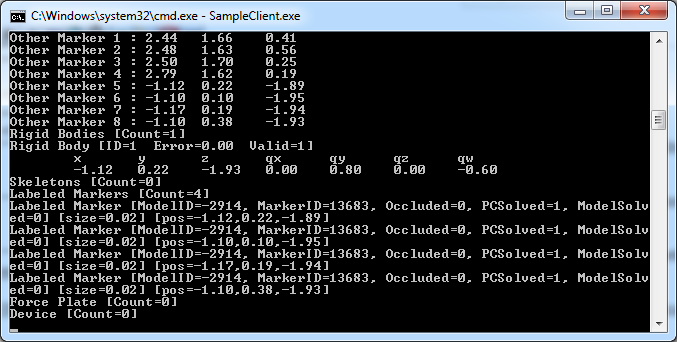 Running the SampleClient project from the windows command prompt. The Rigid Body sample (SampleClient3D) illustrates how to decode NatNet 6DOF Rigid Body and Skeleton Segment data from OptiTrack quaternion format to euler angles and display them in a simple OpenGL 3D viewer. This sample also illustrates how to associate RigidBody/Skeleton Segment names and IDs from the data descriptions with the IDs streamed in the FrameOfMocapData packet. IP Address	IP Address of client NIC card you wish to use. Server IP Address	IP Address of server entered in step 2 above. 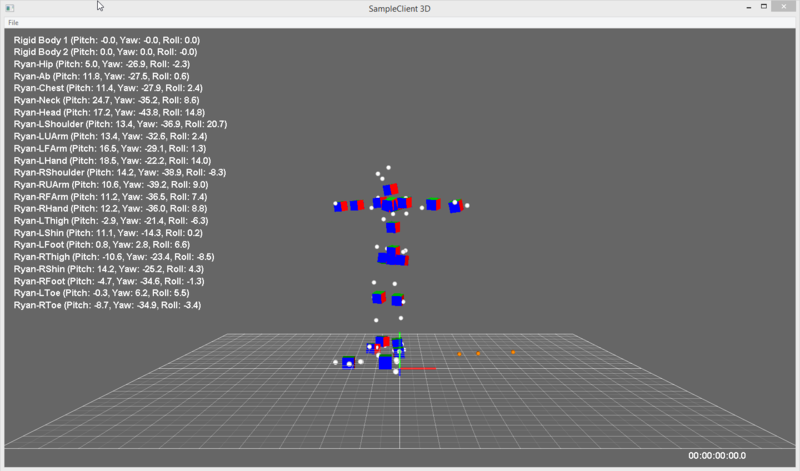 SampleClient3D - Decoding and draqing labeled rigid body position and orientation (6DoF) data. 1. [Motive] Start a NatNet server application (e.g. Motive). 2. [Motive] Enable NatNet streaming from the Server application. 3. [WinFormTestApp] Start the WinForms sample application from the NatNet Samples folder. 4. [WinFormTestApp] Update the “Local” and “Server” IP Addresses as necessary. 5. [WinFormTestApp] Press the “Connect” button to connect to the server. 6. [WinFormTestApp] Press the “Get Data Descriptions” button to request and display a detailed description of the Server’s currently streamed objects. 7. [WinFormTestApp] Select a Row in the DataGrid to display that value in the graph. Receiving tracking data via NatNet in a .NET environment. Issuing remote control commands to Motive. 1. [Motive]	Start a NatNet server application (e.g. Motive). 4. [Matlab]	Open the NatNetPollingSample.m file. 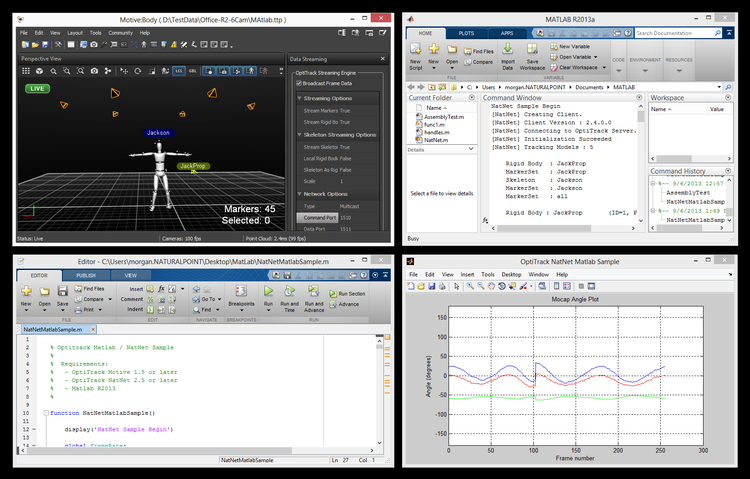 Rael-time streaming mocap data from Motive into Matlab. This page was last modified on 1 April 2019, at 18:59.